This panel brings individuals together who are using their innovative ideas and creative minds to impact the work that they do; whether it be for community efforts or for-profit. Panelists will speak on their experiences and share knowledge with the students as they ask questions and seek empowerment in their own journeys. This event will be a unique combination of current UI students and high school students that we are bringing to campus in collaboration with the UI Office of Admissions. 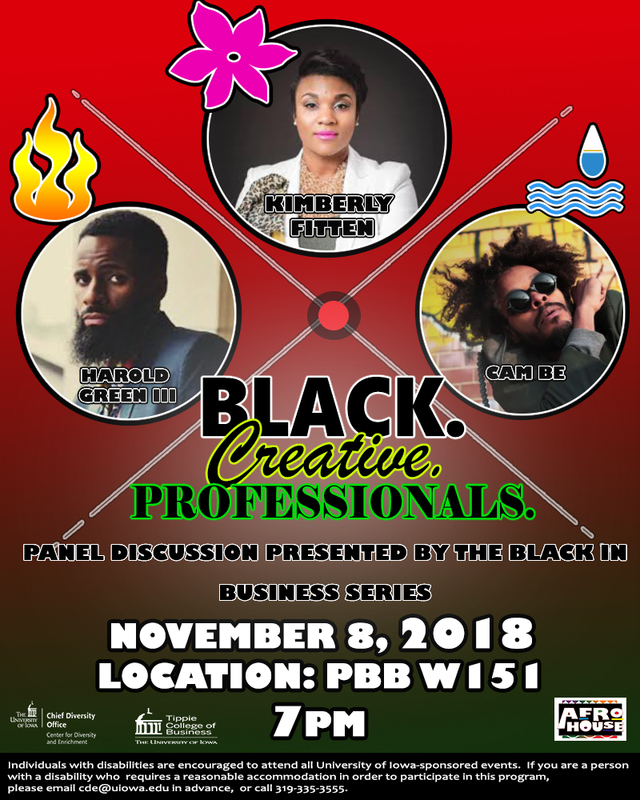 The Black in Business Series aims to extend our outreach and create pathways for these students in the areas of business, entrepreneurship, the arts, and non-profit work. We would hope that you can participate in the passing of knowledge, skill, and information to our bright and vibrant students at here at the University of Iowa. The Center for Diversity & Enrichment and the Tippie College of Business coordinate the Black in Business series in order to expand dialogue in the Black community around issues of higher education, business, and entrepreneurship. The series hopes to broaden the perspectives of Black students and expose them to unique mentorship opportunities. This series is in collaboration with the Division of Student Life's Being Black@Iowa Project. Our goal is that students will learn more about business from black professionals, discover their inner entrepreneur, and be empowered. Students do not have to be business majors to attend as we encourage them to see that anything they do in their professions can be seen as a business.